Bishop Tracy S. Malone announced the following clergy appointments and/or changes of status since publication of the March 4 E-News. Unless noted otherwise, appointments are effective July 1, 2019. More than 1,200 people attended the three post General Conference information meetings held across the East Ohio Conference March 9 and 10. Nearly 1,000 more watched the live stream of the March 10 meeting held at Strongsville UMC. You can watch the video of that meeting on the Conference YouTube page at https://www.youtube.com/user/EastOhioUMC. You can also view the album and download photos from the three sessions by visiting the East Ohio Conference Flickr page, https://www.flickr.com/photos/eocumc/sets/72157707297795395/. The Rev. Dr. Gary George is one of 12 individuals named by the Commission on the General Conference to investigate possible improper voting at the recently completed Special Session of General Conference. A preliminary review found that “a very limited number” of ineligible people potentially obtained credentials to vote. Learn more. Practically Honest is a podcast for those who work and live with young people. This week’s episode is an open and honest conversation by veteran United Methodist youth leaders who are struggling together to move forward after the Special Session of General Conference. We all come from different perspectives and serve in different areas. What we know for sure is, we love Jesus, and we love young people – and, sometimes, that is enough. Find the podcast through the blog, on itunes or follow us on Facebook. When is the right time for healing? When is the right time for building new relationships? When is the right time to hear the stories of the indigenous peoples of our land? 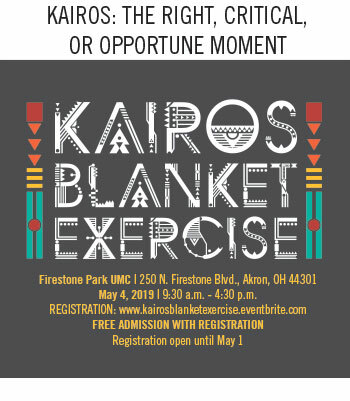 Join us at Firestone Park UMC in Akron from 9:30 a.m. – 4:30 p.m. for the latest Perspectives event, The KAIROS Blanket Exercise. This uniquely powerful participatory history lesson — developed in collaboration with indigenous Elders, knowledge keepers, and educators — fosters truth, understanding, respect, and reconciliation among indigenous and settler peoples. Come be part of this opportune moment facilitated by Cree Elder Delvina Kejick and her team from Canada. Visit us from 2:00-5:00 p.m. on Saturday, March 30 to explore the beautiful setting of Camp Aldersgate. Nestled on the shore of 1,000-acre Leesville Lake, Camp Aldersgate boasts summer cabins, a lodge, tree house, pedal boats, canoes, sailboats, pontoon boats, a water trampoline, a water jungle Jim, a splash mat, and a year-round retreat cottage. Take in the awe-inspiring and humbling terrain, check out our amenities, and see all that Camp Aldersgate has to offer. Lots of people say, “When I pull into Camp Asbury’s entrance, I feel like I’ve come home again.” Others say, “Camp Asbury is my home away from home.” You are invited to visit us at Camp Asbury from 2:00-5:00 p.m. on Sunday, April 17. Come get a taste of Camp Asbury. Tour the facilities, meet and talk with current and past summer staff members, get information about our summer camp programs, and find out why people say Asbury feels like home. We look forward to meeting you on April 17! 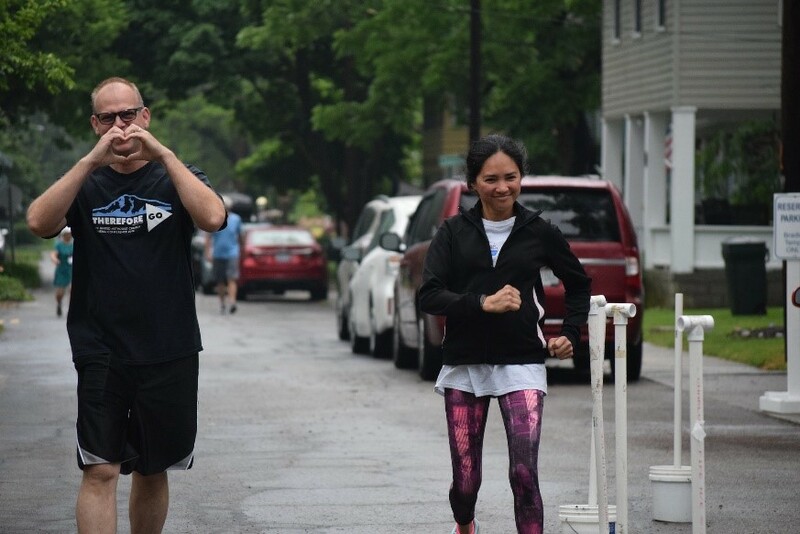 This year’s Annual Conference Missions 5K run/1-Mile walk is a big one! In recognition of the 200th anniversary of Global Ministries, so our goal is to have 200 participants run/walk at Lakeside Chautauqua! Even if you’re not going to Annual Conference, you can still donate to support East Ohio Missions. Learn more and register. If your church is heading out on a mission journey this summer with a team leader trained by United Methodist Volunteers in Mission (UMVIM), your team can apply for scholarships. The UMVIM committee meets quarterly to review applications, the next deadline for applications is April 5. Learn more and apply. With those words, the 7th Circuit Court of Appeals ruled that the clergy housing allowance exclusion in federal tax law is constitutional. The 29-page decision has major implications for clergy across the United States, as it reversed a lower court’s decision that had ruled the housing allowance exclusion unconstitutional in 2018. It is not known at this time whether the case will be appealed to the U.S. Supreme Court, and if so, whether the Supreme Court will take it up. Read the court’s decision in its entirety. In the March 18 edition: We explore further along A Way Forward, The Inclusive Bible, Leaders for Tomorrow, a different Lenten fast, and CBD for pain relief. She Dreams encourages you to discover and follow your God-given dreams through the biblical story of Moses, which reveals how God calls, equips, and trains us to pursue the dreams He plants within our hearts. The New Testament You Never Knew goes behind the explosive story of Jesus’ baptism and journey into the wilderness, the meaning behind his parables and miracles, the significance of his death and resurrection. Dialogues on the Refugee Crisis invites readers to look beyond the headlines and into the real experiences of displaced people to determine what a faith-filled response to this ongoing crisis might look like. Think Believe Do – Mission gives youth the perspective of mission from the view of another teen, who explores her beliefs alongside your youth group. The United Methodist Financial Credit Union will soon roll out Mobile Wallet! Apple Pay, Google Pay, and Samsung Pay will all be compatible with our UMFCU debit cards. This is a convenient way to keep your information secure and add ease to your shopping experience. Please check your phone’s compatibility with using a mobile wallet, as it is only available to certain phone models. Mark J. Reep, retired Elder, died March 2, 2019. Marjorie Ann Pohly, surviving spouse of Kenneth Pohly, died October 20, 2018. The next scheduled edition of the E-News is Monday, April 1, 2019. Deadline for submission is Wednesday, March 27. Send articles to swilliams@eocumc.com.